Transforming the world through digital innovation, technology and openness. How could I resist a conference with this as its strapline? Last in my set of 4 events, this promised to be a busy day, with a packed lineup of speakers. My highlights were mostly in the morning, a range of panel debates, interviews, and lightning presentations from innovators, but the panel discussion on open data near the end was interesting too. Started off with Chris Vein, chief innovation officer at the World Bank, who I heard from earlier this year when he visited DFID. His theme was open development, and his aim at the Bank is to embed this in everything they do, the way they work as well as outcomes. His key message was that all activities should start with the individual and their problem/situation, systems and approaches follow. User centred: dig deep to understand needs and work out solutions together. Data driven: tech gives us the option: real time data to make real time decisions. An example was Ureport – a project in Uganda, where instances of banana disease can be reported, via SMS. 45,000 responses in 48 hours led to a to map of the spread of the disease, which led to distribution of info about how to solve the problem. Real time decision making. Reusable: too many examples of programmes started afresh. Scalable: everyone wants to try something, suffer from pilotitus as 1,000 flowers bloom. World is littered with dead flowers, we need to think about scalability. Sustainable: consider how to sustain after the initial success. Open: Example of community mapping as what happens when data is open and the community involved. Security and privacy: Should always be a priority. His final message: Technology is a potential gamechanger. Individuals are central, new voices are involved. She talked powerfully about the girl effect – how it is vital to stop poverty before it starts, and their absolute focus on adolescent girls. use missed calls to communicate safe arrival when they don’t have any minutes, or urine to power generators to charge phones. Her challenge to all was to think big – and she mentioned the partnerships Girl Effect has built, including with another foundation, and with DFID. Working together enables them to achieve more. When asked if she had a message for all the billionaires out there looking for something to focus on, she said “dont build more stuff – find partners and work with what we already have”. Can tech companies survive the big data scandal? She introduced their meaningful brands research: a big, robust global analysis which looks at relationship between people and brands. Besides things like look and cost, also covers how/ if it makes a difference to your life, does it make you happier, make life easier etc. An intriguing point was for example a company like google which has an extremely high “makes life easier” score, but has been criticised for its tax arrangements – people still like it. Perhaps for some of the big tech companies, high scores on one side mitigate lower ones on the other? Her conclusion was that tech companies need to explore more all round meaningfulness. They can survive data scandal if they do this. They have so much data they have power, but this means even greater responsibility. Hans Vestberg, CEO Ericsson, talked about the impact of lowering the price of tech. He said that currently there are roughly 2 billion subscriptions. In five years time, there will be six billion. Implications of this are huge, the advances of the last ten years can only increase. He agreed we need innovative solutions to bring improved connectivity to rural areas – the google experiment with balloons was an example of this. He remarked that connected devices are definitely the thing of the future, will make more efficient society, business and life. Examples go way beyond fridges and washing machines. Networked society is the next phase beyond the rollout of tech and infrastructure. It will affect us in ways we cannot yet imagine – and raise issues that will have to be thought through. Those with smart phones are already transformed, note that the majority of the time you are on the phone you are not calling someone. He was asked whether he thought the pace of innovation was slowing. Have we hit the limits? No, there will be devices of different sizes and shapes. Limitations have been imposed by chips, this will change. Different devices for different purposes. Hub of connectivity will be something we’ll probably call a smart phone, but may look different. A panel followed chaired by Jemima Kiss, technology head at the Guardian, which talked about cities and innovation. Most talk was of the Tech City initiative in London: what was it that created the right environment for tech business to thrive at this time? They also talked about how to support other clusters outside London, but there was an interesting thread that British people not good enough at promoting their successes. The media doesn’t help – we need to celebrate entrepreneurship. Programmes like the apprentice really don’t help, no positive role models, this is how people think business is……(do they?!). risks and build huge companies. Need to allow people to dream big. Perhaps a cultural message about our society? Do we need more eccentricity. Three talks followed in the Kucha Pecha style – 20 slides each allowed 20 seconds. All were fascinating. Clive Biehl, of the raspberry pi foundation, reminded us that computing has deep roots in the UK, and looked at next phase, when people want to create their own stuff. Raspberry pi let’s you experiment and play. Its a toolkit for thinking, which reaches across all areas of the curriculum. Means computing not seen just as geeky, lots of wider applications. Once people shown how to code, they get very creative. Aim isn’t to make an army of coders, it’s to expose people to range of ideas then let them pursue their own interests. weakness in solar was the problems around battery storage. Aimed to raise funds for a trial, aimed for £55,000 and got almost £400,000. How did they engage with the crowd? They produced a short film which showed how life could be improved by this product, made content blog friendly, and reached target by day four. Buy one give one idea took off, appealed to people in west, they could be a part of changing the world. Danae Ringelmann is the founder of indiegogo – the crowd funding platform that was used in the gravity light story above. Basic premise is that the internet has opened up person to person activities. People want to fund things, people need finance. Problems arise when there are gatekeepers in the finance system. Indiegogo is largest gatekeeper free crowd funding system. No judgement, no barriers to applications. Power is in the hands of the people to decide which projects get funding. Had to create a data security team, to stop attempts to try and break it or use it in appropriately. Have to allow failure, it’s ok to have an idea that actually people don’t want. Makes better ideas come to life. ” unleashing more happiness in the world”. Does sometimes lead to more traditional finance deals – initial funding from a crowd funding platform means VCs can see that something is valued and people want it, so gives them confidence to fund it next. Daan from Amsterdam introduced peerby. Lots of things that we buy, we only need once, or once in a while. How about you could just borrow the things you needed? People value connecting with peers, and prefer to use rather than own. Look at the rise of sites like airBnB, car and bike sharing. Peerby.com enables you to borrow from people in your neighbourhood. Revenue model? Borrowing is free, but borrower is offered an insurance in case things get damaged. Launch by pinpointing key early adopters. They need one hundred to start, then viral referrals. In Amsterdam, where there are 10,000 members, 60% of requests are fulfilled within 30 minutes. Saves money, saves carbon, less waste. The team has moved to London and joined techstars. Second winner was Libby Powell who talked about radar. Their aim is train and support reporters from some of the most isolated and excluded communities in the world to share news and influence policy. Their small team of journalists, trains, mentors and supports citizen reporters, especially rural poor, women and girls who are consistently excluded from debate. They use mobiles to send messages, which are then edited and shared. Train people on reporting, they send mobile reports to central digital hub in London, where content is verified and edited for publication. It is also pitched to mainstream media outlets. Their case studies show that voices from the margins CAN contribute to policy. A panel discussion followed which talked about funding models – 10/10 to the Guardian for bringing together a balanced panel with 2 women and 2 male reps of venture capital organisations – to talk about a field where I’m sure the gender ratios are not so balanced. Also, 10/10 to the women for looking really smart and professional, and talking smartly. I’m afraid I wasn’t impressed by the men. Top of their fields they may be, but scruffy and slouching, I found I didn’t take them as seriously. 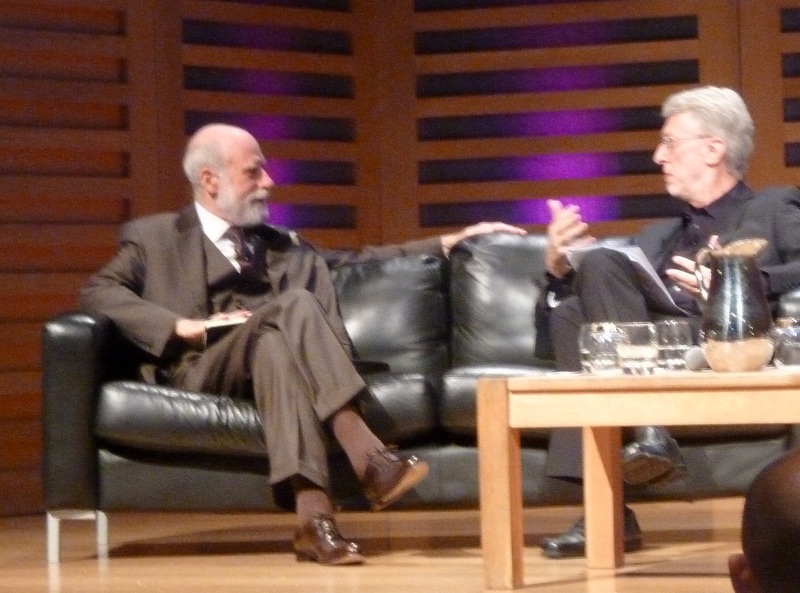 The last slot before lunch was a wonderful talk with Vint Cerf. Often introduced as one of the fathers of the internet, he has a wonderfully rich voice and shared many fascinating insights. First question was topical, around recent privacy related issues. A: Are a lot of dangers around the net that need to be worked through. Once something is out there, it can get into the hands of people whose views don’t necessarily match your own. Must work constantly to protect the network, build in defences, but there are also things that individuals can do to protect themselves eg good passwords. Two factor authentication while annoying is a good thing. Basically there is no such thing as bug free code. Q: What do we lose if we react too far to recent issues? Could too much encryption mean we can’t do the things we want anymore? A: Work to authenticate users, work to make sure users don’t interfere with each other, more encryption not the answer. Not good for business or consumer. Careful architecture, that says once you are in, you are safe. Q: Sitting here in the Guardian, which is trying to bring itself up to date. What did he think about traditional news media? A: Still thinking about a product, thinking in nouns. Vint and his world thinks in verbs, in actions. Online is completely different model to print, so how do they rebuild the model? What if the info you got from the news also led you to a place where you could take action? Might not work for every item, but as a product turns into a service, it could start to, especially with the Internet of things. Following that, if you re-imagine media, how to re-imagine government? People want it to be as simple as possible, take out friction, interaction should be whenever individuals want it. Q: Where does VC see the Internet going? A: Concern about keeping it safe. He’s an engineer, so that’s a problem to be solved. Wireless, higher speeds, better access, all coming. Next big thing? What Doug Engelbart thought: computers could augment human intellect. 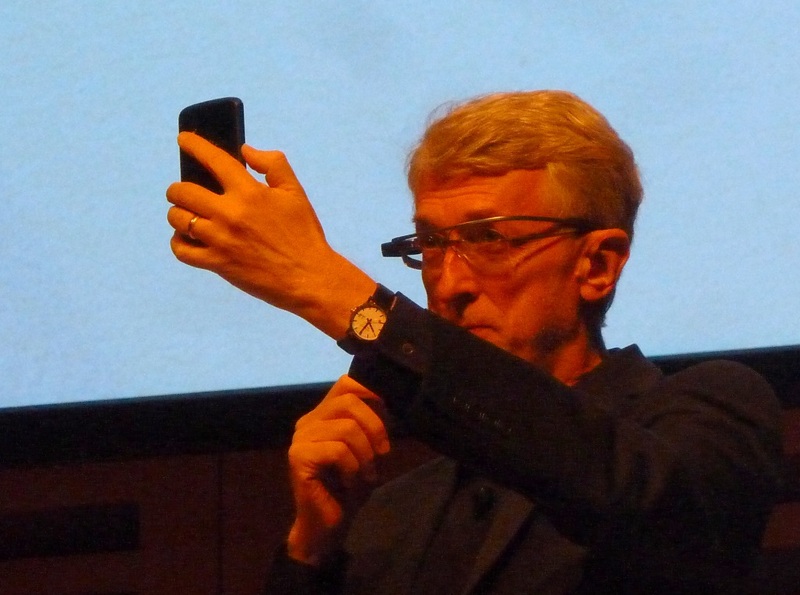 Eg google glass project, a computer almost becomes your partner, facilitator and enabler in comms. He envisages a day when you have a conversation with a computer instead of typing commands. Q: about how web content is changing the way knowledge is structured, eg books in different print sizes can have different numbers of pages, so how do you reference a page number. Possibly need a new structure, a DNS for knowledge? Q: about libraries, is google one of their biggest challenges? A: VC firm about ensuring the notion of libraries continues, role will evolve to becoming curators of knowledge. Need to save bits and their context, avoid bit rot. Augmented computing capabilities will augment librarians, but can only do that if we retain the notion of a place where knowledge is curated. Need the infrastructure to be sustained. Q: At what stage in the development of web was notion of ‘state’ added? As this has am impact on privacy. Is the answer technical or institutional? A: Has to be the latter. The ability to infer information from partial info is very powerful. So managing has to be mix of legal and social frameworks. People are quick to rush ahead and adopt new tech, don’t think about the implications. What about people who are accidentally in an image that is shared ( ref google street view issues). New tech can have unpredictable outcomes. Haven’t yet figured out the conventions to protect people. Will probably have to keep on learning by mistakes. Q: Does google glass negate or trump any concerns around NSA? A: Don’t blame tools, it’s about how you use them. Google glass has been released in prototype simply to see how people use them, and are starting to see some amazing applications. A: What happens to concept of control in a digital environment? Pretty much gone. Creative Commons idea is important, opens up range of choice. People need to pause and think about new models now there are new options made available by tech. A panel on young tech talent came next. Interesting comments from a 13 year old who now runs a company. His parents thought he was playing games, not building them. His advice to teachers was to let students find their own way – set them challenges, but dont be too prescriptive about how they address them. The panel shared a range of views about the value of university, mentors, and incubators. 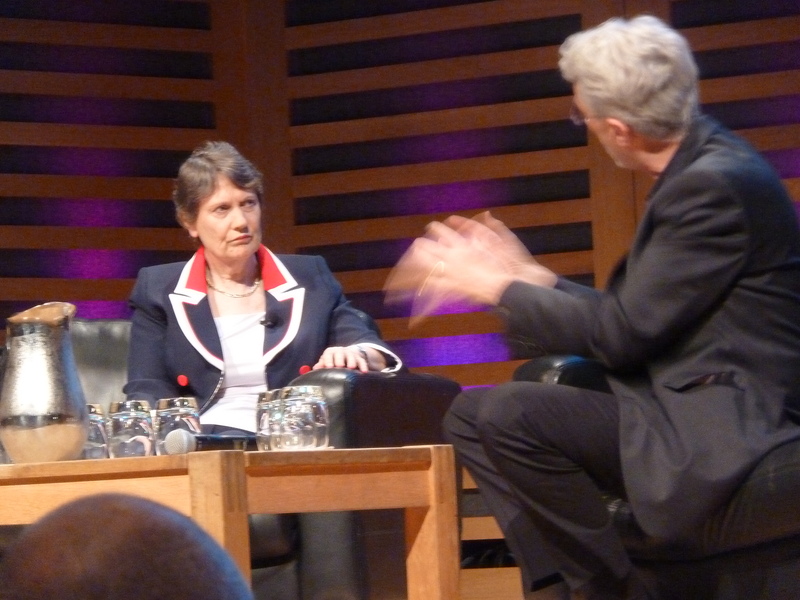 Helen Clark was the next interviewee – the former Prime Minister of New Zealand who is now head of UNDP. She spoke about the process to come up with the successors to the Millennium Development Goals, and in the context of how tech can support engagement, made the perceptive comment that governments now have no excuse for not knowing what their citizens are thinking. Recognised however that government needs new structures to be able to listen effectively. Tech is huge supporter and enabler of development. It has many roles to play, not least enabling the conversations. She shared practical plans to deal with the revolution in development f#data that the transparency agenda is bringing. Data is made available. Yes, UNDP has teams analysing it, but they also put data out there, and if others come up with different analyses, that’s good. She was asked about her distinction between citizens and consumers. She prefers to talk about citizens, as it implies involvement, rather than ‘I don’t like that brand, I’ll try another’. Need to overcome ennui. Tools we have now should mean two way communication between those in power is the norm. Matt Simons talked about Thoughtworks – a consultancy that uses tech and disruptive thinking to help organisations achieve big changes. They are doing an increasing amount in the development sector. Three more lightning talks followed, of which the most fascinating served to remind us that tech does not always mean web. talked about a project called swarm organ. It was complicated, but basically talked about how a combination of computer science and biology is going to change the way we build things. Currently, a thinker and doer are external to the actual object. Inventions are fragile, they break. The best analogy was Lego. Take a leap of imagination, and imagine Lego bricks which didn’t need a builder, they could choose themselves which place to crawl back to and thus a broken model could heal itself. Mini robots do exist, so the doing should be possible. The thinking bit is the programming, each robot would have to be programmed to tell each brick where to go, but problem is that it can’t see the whole picture, can only see neighbours. This is where biology steps in. Each cell in your body knows how to develop in relation to other cells. Look at how some creatures can regrow a limb if they lose it. Cells are like little robots. If you could create this swarm, what would you build? The limits are only your imagination. Once the gap between thinkers and doers is removed, objects will build themselves and be less fragile. The final three sessions were a panel discussion on open data – which I think I’ll cover in a separate post (give me the opportunity to bring in other examples I’ve heard recently) – then a slightly overlong interview with Ev Williams – who has a fascinating CV as he was co founder of blogger and Twitter, and is now behind the long format writing platform of Medium. Not sure they really addressed the title of the session, which was billed as being about the future of long form journalism. Last was Nick Bostrom from Oxford University who shared his early thoughts about surveillance and privacy issues. He made one intriguing point that even just putting a poster of a pair of eyes in a workplace would cause people to change their behaviour – just the idea of being watched is enough to deter some? As I said at the start – a bit of an epic post – but lost to think about, lots of nuggets of information and ideas that will take a while to digest. Not an official conference season, it just seems as though a lot of opportunities to get out the office and hear about the bigger picture (several different angles on different big pictures) have come up around the same time. First up was Africa Gathering – and I’ve already blogged about that inspiring couple of days. Next was a completely different community – the Government Communications Network event: headlined “Towards exceptional government communications”. Timed to build on the recently published Government Communications Plan , it was a morning of quick fire presentations (probably a bit too quick fire – the whole timetable overran unfortunately and I had to leave before the concluding remarks), and some speakers tried to pack way too much into their slots, but overall the headlines were clear and the challenge of meeting those aspirations lies in the year ahead. Some highlights from the sessions follow: first, the challenge, as laid out by Alex Aiken, executive director og government communication, who chose that day to join twitter. Overall role of government communications people, no matter which bit of it you are in, is to save and improve people’s lives. The aim is to change behaviour for the public good (which sounds kind of big brother-ish now I see it written down) – but examples are clear: blood donor recruitment, fire safety, Scottish government campaign against breast cancer (powerful evaluation which followed up with calculating how many lives saved). So, there is much excellent work, but the problem is that this is not universal. Two acronyms mentioned: the old = SOS, sending out stuff. The future is ROSIE: research, objective, strategy, implementation, evaluation. Future government communications needs to remember and implement this planning cycle, needs to be more professional, more shared services, better planning. And that was the event in a nutshell – these themes came up in all the sessions that followed. Conrad Bird presented a case study of the GREAT campaign – whose overarching purpose is about jobs and growth for Britain. It uses credible voices and showcases Britain as world class destination for business, investment, education and tourism. It is rigorously evaluated, has a strong visual identity and the campaign leaders message was to “Think big, be iconic.” And calculate business benefits relentlessly, as this is the way to secure future investment in the programme. Conversation followed about the role of the Government Communications network in supporting the work of individuals. Lots is planned – and shared via the website. Again and again the importance of evaluation was mentioned, and a key quote for me was that one of greatest barriers overall is inertia, people just don’t want to change things. A later speaker endorsed this – in the private sector, evaluation is your best friend, a way of getting the best impact out of limited resources. You can go to a board and show what is working, what should be invested more in and what can be stopped. A key point from another speaker reflected the change he saw in the role of communications teams is that we are no longer communicating for our organisations, but communicating through our organisations, getting as many others as possible to be chief narrators and brand champions/advocates. A session on digital gave a powerful example of what can happen when end users are actively involved in designing a campaign. He spoke about the disability working campaign, where at the start, activists were their biggest critics, now they sit round the table, and are becoming advocates. He mentioned the tinymanblog.com written by one of their partners. Other quotes that rang true: “Social media is a discipline not a tool”. “Measurement should focus on conversation and communities, not coverage”. “Experimentation is key to success”. An intriguing session about the changing environment commented how we are moving from deference to reference: Katie Price has 1.8 million followers, David Cameron has 400,000 – conclude from that what you will. Next conference was Civil service live 2013 – again using word exceptional, this time as their strapline: “Be exceptional”. The event took place in 3 separate locations this year. I spent a day in London Olympia hearing from a diverse group of speakers and looking at case studies from right across the public sector. Where else would you find in one hall a heap of tiger, bear and zebra skins, a full size Austin 7 car, a “workplace of the future” that looked like the Starship Enterprise – all white surfaces and shiny gadgets, plus a military installation complete with camouflage-clad soldiers and sand bags. Interesting points I picked up included from Carole Thompson, former COO of BBC, on managing change. She oversaw the move to Salford, and talked about how she built a team to focus on the vision, not just manage a project to build. It was about creating a new BBC, “the BBC of your dreams”. She also talked about the need to continue to manage even after official project end, so that it continues to work successfully. I heard about the Vodaphone better ways of working initiative which is spookily similar to our new offices, with people being equipped with laptops and able to work anywhere in the building, with a variety of different spaces depending on whether you need to be quiet and focus on your own work, or catch up with colleagues. They, as we, have introduced a system of shared spaces, where no one has their own desk. They have identified different profiles for fixed, field and flexible staff (defined as those who need a fixed location like receptionists, or security guards; those who are virtually always away from the office like engineers; and the rest – who can work wherever is needed to achieve their objectives. The main plenary speaker was Cabinet Office minister Francis Maude, who shared his reflections on civil service reform. Unknowingly continuing the theme started in the GCN event, he repeated that in some places things do work fantastically well, however the task is to identify these, showcase, and make things work well everywhere. He reminded us that when the civil service reform plan was published a year ago, it was criticised in some quarters as it wasn’t very high flown, with grandiose ideas, but it was actually practical, gritty. In a week or so, a one year on report will be published, a sort of scorecard which monitors how well we’ve done. Statements about the age of the generalist either being dead or having arrived are not true. Organisations need both: generalists who can think issues through, prepare choices, make decisions; and experts with deep knowledge. The era of the specialist makes people less likely to admit when they don’t know something, while a good generalist will be quick to recognise, and find the person who does know. A reformed civil service will be smaller, flatter, more unified, more accountable for delivery, with better talent management and modern terms and conditions. He repeated that it’s not about just one thing – however if he had to, he’d say it’s about being focused on outputs, not on process. Interesting side comment about traditional civil service values – impartiality can be interpreted as indifference – passion is what is needed so people think differently and come up with innovative solutions to challenges. End comment: one of the reasons he enjoys his job is because its difficult, Times mean we need to live by wits, innovation etc. What civil service does IS important, it matters, and it can be done. Next main speaker on civil service reform was Sir Bob Kerslake, head of the civil service. He echoed Francis Maude in saying that the true story of civil service activities rarely gets any exposure, especially in the media. His message covered why reform is good for Britain, for the civil service and for individuals. For Britain, because it will improve services for individuals across the country. In focusing on services to the public, they will be made clearer, easier, simpler. For the civil service, because it will make us more unified, reduce duplication, and people will be able to move around more easily. Policy making will become more collaborative, working across departments. For individuals, because they will have well designed workplaces, equipment and tech that works, simplified security arrangements so people can work in different places, plus better performance management and flexible working. The day ended for me on an interesting and energetic note, with the presentation on open data and innovation by Paul Maltby. I’ve already used some of the examples he shared to help illustrate these concepts to colleagues. He started with a brief overview of what open data is – and the main thing is that data is freely available, no conditions placed on reuse. He talked about the much wider environment, which includes linked data, big data, and the internet of sensors/things. Common questions are what people do with this data – and he mentioned the familiar Guardian data log and their bubble diagram visualisations. The Cabinet office team focus on extracting the data and making it into raw material for others to use. He praised the government portal: http://data.gov.uk/ as a world leading model which is influencing many which are being developed in other countries. Note that besides making data available, it is responsive: people can use it to make requests for data. Recent highlights in the open data world include the Shakespeare review which lists priorities, plus the Lough Erne open data charter. He mentioned the Open government partnership, of which the UK is co-chair, and planning going on for their conference in the Autumn. He described the formation of Open Data Institute, which is focused on creating value from open data by incubating startups and providing training. So, lots happening, and positive glimpses of how things could be in the future. Which works as an overall wrap up of these events – lots happening, and positive glimpses. Three down, one to go!